Is there a better alternative to Activity Audit? Is Activity Audit really the best app in System category? Will Activity Audit work good on macOS 10.13.4? Activity Audit creates a journal of the applications you use on your Mac. The journal acts as an audit trail, documenting which applications you use and how long you use each one. After just an hour, you will be amazed the information revealed by Activity Audit. After a day, you will gain new insights into your working pattern and how you spend your time on your Mac. Activity Audit needs a review. Be the first to review this app and get the discussion started! Activity Audit needs a rating. Be the first to rate this app and get the discussion started! 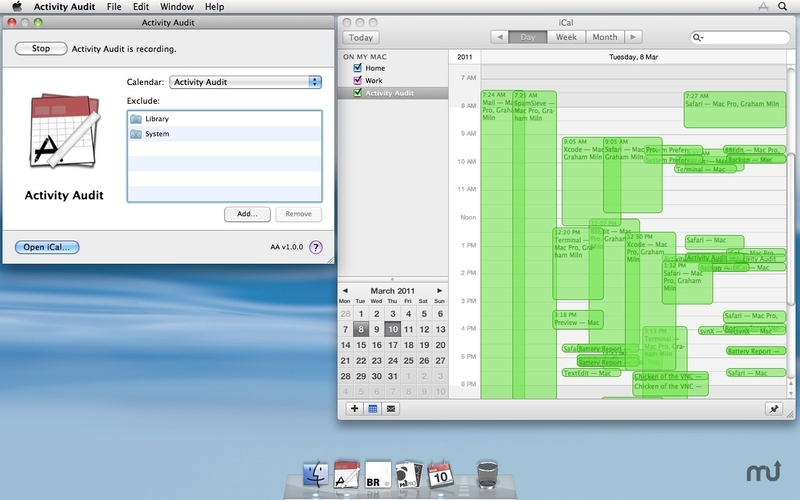 Activity Audit works seamlessly with OS X's iCal to bring you a calendar of your activity. Each time you open an application, a calendar event is created. The event is automatically extended as the application continues to run. When you quit the application, the event is completed. Activity Audit is quiet and unobtrusive. Once started, it runs invisibly in the background. Designed to be started and left running, Activity Audit does not demand attention or alter your workflow. Start auditing, quit Activity Audit, and get on with your day.